Last month, YIMBY reported that permits were filed for what we thought was the first major market-rate residential project in the core of downtown Jamaica, in eastern Queens, since the area was rezoned in in 2007. It turns out we were wrong. A 21-unit, seven-story building at 190-11 Hillside Avenue, near the corner of 191st Street, has got it beat. The developer – Great Neck-based TCX, an offshoot of The Construction Experts – told YIMBY that construction there began last December, and is expected to wrap up in January 2015. The 15,000-square-foot apartment building will hold mainly one-bedroom units, with a three-bedroom penthouse. The one-bedrooms, TCX’s Joshua Asherian said, will rent for around $1,600 a month – very affordable compared to new construction in Manhattan and the trendier parts of Brooklyn and Queens, where similarly-sized units can easily go for twice that. The area around Hillside Avenue is one of the most diverse in New York City, so it’s hard to pin down who the renters will be, but Asherian told YIMBY that the project would be appealing to students at St. John’s University, whose Queens campus is in nearby Hillcrest, on the other side of the Grand Central Parkway. De Fonseca Architects are responsible for the design, whose rendering TCX shared with YIMBY. It depicts a handsome black brick building with tall glass windows in the middle, flanked by columns of balconies – one set recessed, like the garden apartment buildings erected just after World War II, and the other protruding, as is more popular nowadays. 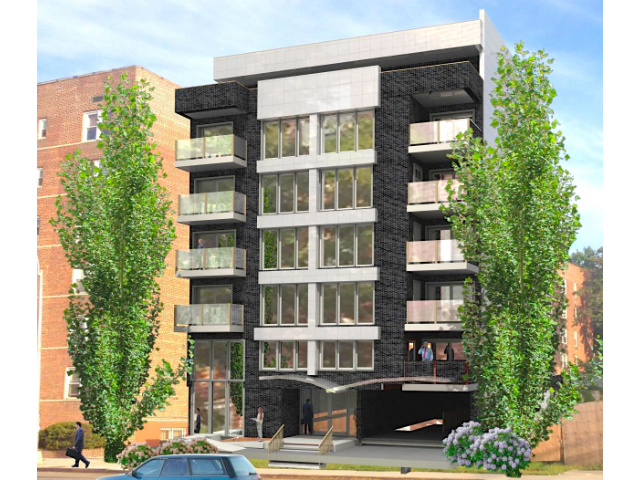 The façade will be uncharacteristically clean for a new rental building – especially one as affordable as 190-11 Hillside – thanks to the lack of PTAC units and their unsightly grills. Instead, the builders are using mini-splits, whose condensers can be hidden in less obtrusive locations, and which offer more constant temperatures inside the building without bulky units taking up room below the windows. 1 Comment on "Revealed: 190-11 Hillside Avenue"
I AM INTERESTED TO PURCHASE A 2-3 BEDROOM APARTMENT ON HILLDIDE AVENUE IN QUEENS.PLEASE CALL OR EMIAL ME IF HAVE ANY OR CALL ME AT 347-813-7668.